Traditional limestone or calcite neutralization systems are designed for ease of use however, higher flow rates can result in inconsistent treated pH levels. 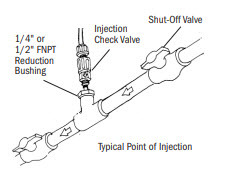 Chemical injection systems are installed by dealers who want more control over the neutralization process. To get even correction of variable flow rates, installation of a chemical feed pump system, such as Stenner, is recommended. This is especially important for commercial and industrial applications. NSF certified sodium carbonate, soda ash, Pro Products Nutra 5 and Nutra 7 are suitable for residential use. Potassium carbonate is also used but very expensive. Sodium hydroxide may be used in industrial settings where chemicals are safely handled. Why treat with soda ash? Ability to treat pH as low as 4. Consistent correction of variable flow rates. Does not affect water hardness. A typical residential application requires a chemical feed pump with a maximum setting of 30-50 gpd (gallons per day) and a suitable chemical storage tank with a childproof cap. The saturation point of soda ash is 1 pound per gallon of water. Start with a 1/2 pound of soda ash per gallon of water. Set the chemical feed pump at 50% of the maximum feed rate. Run the water and test the pH downstream of the injection point. Adjust the chemical pump feed rate based on test results. Installation of a retention tank or contact tank is highly recommended to give soda ash time to react with the untreated water. Retention tanks can range from 40 – 120 gallons, application dependent. To save time mix soda ash with warm water (70-80 deg.F) so it dissolves more quickly. Use a tank mixer (automatic stirrer) to keep the soda ash completely dissolved. Adhere to a strict maintenance schedule to avoid the effects of low pH. Special consideration has to be taken with chemical handling. Soda ash should be kept in clearly marked containers and out of reach of pets and children. Proper safety equipment is mandatory when handling soda ash- safety glasses, appropriate gloves and clothing. Refer to the manufacturer’s directions before handling.